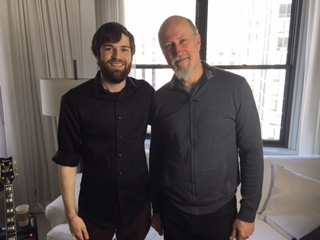 When I first got the news we’d be hosting an interview with John Scofield for his upcoming Ibanez signature guitar releases, I had a mild freakout…and that’s putting it lightly. Scofield has been one of my major influences on guitar and has certainly shaped my own improvisations and compositions (plenty of hours were spent by candlelight figuring out his solos in hopes of being able to tap into his not-quite-straight-jazz-but-not-quite-funk-rock guitar sound). At this point in his career, Scofield has practically achieved legend status, so getting to meet him and discuss it was a once-in-a-lifetime opportunity. At the time, he was in town for the night on tour supporting the release of Sco-Mule, a 1999 live recording where he played alongside Gov’t Mule. The first thing about Scofield that became apparent was that he had a ton of great stories to tell, and why wouldn’t he? He’s played with funk acts, soul, R&B, tons of jazz groups, and on the jam band scene with even more projects that span many more genres. Because of that, I wanted to delve a little bit into the beginnings of his musical career to gain some insight into how he made it. He described his brief tenure at Berklee College of Music and how he left school to pursue touring with some serious heavy-hitters of the jazz world (Billy Cobham, George Duke, Gary Burton , eventually Miles Davis, etc.). While he was discussing his rise on the scene he had a surprising humbleness that is seldom seen among world-class musicians. He wasn’t afraid to mention that he felt like a child playing alongside the greats as a young up-and-comer back then. What a hell of a way to cut your teeth though, eh? Essentially, the best part about playing music was the people he met and surrounded himself with – and that it was just as important as the music itself. After we talked about his beginnings, I naturally had to ask Sco about his gear. He’s definitely got a take-no-prisoners, not-messin’-around vibe goin’ on. I always thought he got a cool drive tone that was totally distinct and just plain worked for what he does. If people have never heard Scofield before, I always mention that he’s the “sassiest guitarist around”. He mentioned his love for using Vox AC30 amps specifically for the way they break up. They’ve got plenty of snarl and bite and I think he appreciates the way it helps his tone cut through. It’s a great compliment to his playing. He’s also been using a J. Rockett Audio Blue Note Overdrive pedal, a Boomerang III Looper, a Digitech Whammy, and the classic Pro Co Rat Distortion pedal, among others. Scofield has also been a long-time Ibanez semi-hollow player and just recently worked closely with them to develop a new line of Scofield signature models based on his old prized Ibanez AS200AV. Ibanez even scanned his original guitar to get the dimensions as precise as possible in order to replicate that guitar’s feel. Pretty cool. John Scofield’s signature guitar, the Ibanez JSM 10. After it was all said and done, the one thing that really stuck with me from the interview was what Scofield learned about his life as a musician. Essentially, the best part about playing music was the people he met and surrounded himself with – and that it was just as important as the music itself was. In my own experience, it does become clear it’s where most of that “togetherness” you get when performing music comes from. This really resonated with me. All in all John was a really nice guy, especially for taking some time out of his schedule to talk to the little guys like me. Just in case everyone out there isn’t a die-hard Sco disciple, I’m including a list of a few songs he’s done over the decades that I feel pretty accurately portray his body of work. I highly recommend them. This entire album is a downright classic, mostly because John Scofield was being backed by Medeski, Martin, and Wood, setting the precedent for an entirely new sound. This track is groovy as hell and features one of my all-time favorite Sco solos to boot. “Blue Matter” admittedly has a more dated ’80s sound, but at the time it was renowned for just how deep the pocket that Dennis Chambers (!) and Gary Grainger (!) were throwin’ down. Sco’s playing on this album is particularly spastic and angular, giving you a taste of his avant-guitar chops. Eddie Harris on tenor sax was the inspiration for the name, and he delivers. This was another one of my favorite Sco melodies too. His solo is really tasty, with great tone and his phrasing and tenacity are out of this world. The album 54 is a lesser-known album, with Vince Mendoza arranging and conducting Holland’s Metropole Orchestra with John Scofield out front as a featured soloist. Sco’s tone out of his AC30 is brash and gritty, which works well to complement the lush sounds of the orchestra. This track is intense and the solos are phenomenal per usual. Is John Mayer Rocking Another Signature PRS?